Tiny House Decisions has helped lots of tiny house builders and future tiny house owners plan their homes. Here's a selection of the testimonials and reviews the book has received. I finished your book in about two days! I couldn't stop reading! It was incredibly helpful and brought up many things (such as ventilation) that I hadn't put a lot of thought into so far. Also, I loved the worksheet! That was so helpful. I'm still in the decision making part of my tiny house, thanks to your guide I decided to wait until I can afford the new trailer instead of a used one. The guide has been so incredibly helpful, I didn't even think about how I'm going to heat my house in the winter! I feel so much more prepared than I did before and I think the building process is going to go so much smoother! 2. Designed similar to the Casa Cubica container home. I've still got a long way to go. I'm so glad I started out with your book before getting knee deep in the construction. I've already made a mental note to go through it a second time with a highlighter. The book has been incredibly helpful and inspiring. I'm still in the ‘ info-gathering' stage at the moment. I'm letting it all sink into my subconscious and at some point the ‘touch paper' will be lit and I'll be off like a rocket. Anyway, thanks for writing such a great book on the subject. I'll be reading it again and again no doubt! Tiny House Decisions was very interesting and informative. I enjoying reading but a lot to absorb so much so I'm sure will read several more times. Thanks so much for writing a very helpful informative book! I read Tiny House Decisions on my flight home following the holidays, and found it really helpful as a bird's eye view of the process. I've been researching TH for almost a year now, and gradually getting my head and heart around de-accumulating, and learning of all the many decisions that must be made. I got stuck on such decisions of whether or not to include a loft, whether to choose stick or SIP, what square footage I think I need, what are my most important priorities, where I might be able to build and park the TH, for example. Expect to come to some conclusions within the next six months or so, and when I get the finances in order, will start next steps. TH Decisions can definitely be a guide to sequencing some of those decisions. Your book is at the core of our planning and research, and it gave us some extra motivation to make the leap. I can give you more details as we continue, but we started by making a checklist from each of your chapters, so that my wife and I could compare what we came up with! It was an awesome way to make sure that we were both on the same page. Tiny House Decisions helped us decide on going with a composting toilet and propane appliances, and we want an on-demand water heater. Cistern for water supply unless we can be successful in finding land we can have a well dug on or that has a natural water source. Thanks to your book we have decided to build on a trailer and went to Colorado Springs, Colorado to see their Tumbleweed tiny house “Cypress” model. We Like their trailers. We would change the inside layout though. 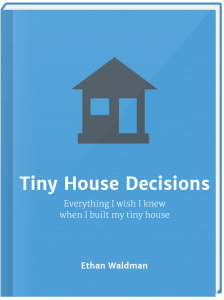 Tiny House Decisions was definitely a must read, and will be reread and consulted again! Your book has been helpful in the decision making process of which systems-heat/water especially that we will go with. The lay-out of the book and ease with which you move from chapter to chapter makes it great reference material. I especially like the pros/cons presentation and how you present resources for us to refer to. I can see us using this throughout the building process and beyond! Thank you for this wonderful book and your common sense approach to building a tiny house! We keep referring back to your book as we are in the process of choosing various things for the tiny house (which we named Tinyhouseescapade). It's been super helpful with the decision overload! Let's start with your workbook first. I think it's a great idea and a very useful tool. It makes for a great addition to your guide. It certainly is better than just having a blank sheet of paper. Being able to read a section and then fill in answers would keep somebody from overlooking something. The pros and cons that you have added from what I feel so very unbiased, well informed standpoint help make choices easier in their selection that works for them. For me, I feel it is a great addition to what you already have the offered to someone who is considering a tiny home. My schedule varies from week to week, and It would be hard for me to plan an online meeting to get assistance in my planning. Your Tiny House Decisions and workbook have proven to be a valuable addition to my planning. And I thank you for that. Your input is greatly appreciated and welcomed due to the fact that you also are in the Northeast. I got to tell you I loved your book. I just finished the first read through this morning. Not only was the information valuable but the way it was written was amazingly helpful. What I liked the most is that you gave various options and explained the pros and cons of both and then told us about your choice and the result. Again thank you for the book. I can't wait to read through it again and take more notes. By the time you are done with Tiny House Decisions, you will have answered every question about all the things you want in your tiny house. This is a MUST read before you start your adventure. Tiny House Decisions gives you invaluable information about every decision you will need to make before ever starting you tiny house endeavor: heating, cooling, electric, propane, on-grid, off-grid, composting or regular toilets, etc. You may be thinking that theses decisions can be made along the way, but very little can be changed once you begin, especially if you are having your tiny house built for you. Everything needs to be cut in, outlets drawn in, exact dimensions, and so on. All of the decisions you make now will affect your house later on. The more you know now, the better decisions you will make and ultimately the happier and more satisfied you will be with your tiny house in the end. Ethan goes through each system that you will most likely need in your home, showing the pros and cons of each choice. Then you make your decisions in the workbook. I found the workbook to be a great addition to the book as there is space with each pro/con and it works you through until you have ultimately made your choice at the end. I am very glad I purchased both as they follow each other along perfectly and I love how it's laid out for me. I know you will thoroughly enjoy Ethan's book and workbook as much as I did. As I indicated earlier, the sheer amount of education and material is invaluable. I've been bingeing the videos and interviews in the guide and I just wanted to say thank you for putting this together. I've no experience in building or really anything like this and it's so detailed and extremely helpful. When I'm able to go through the guide properly and make some decisions I feel confident that I'll know what's best for me! Im in the research state at the moment. I found your book very interesting to read. It was a while back since I finished reading it so unfortunately I don't remember which parts exactly that I found useful in the book. I do remember the ventilation part though as a part filled with lots of useful knowledge. I'm from Sweden and the fact that you as well live in a cold climate, unlike many of the other tiny house builders online, gave me comfort and useful knowledge about what to think about regarding heat and such. I have little to none building experience/knowledge so there is a long way to go (knowledge wise) before my house is finished. I`m although thankful for the fact that your book helped me get one step closer to my dream. Your book has been really helpful in giving us realistic expectations and making us even more excited to build and live in our own tiny house! Thank you so much for all of your help and support. I will be sure to recommend your book to others. Just wanted to touch base again and say how much I appreciated your ebook on all the decisions on building. I really appreciated the insulation portion as that is still the section I'm on the fence about. So many options! Anyhow, love the book – very well written and extremely inspiring. Thanks again for all your insight. I really do think that it breaks it all down into manageable bits for people to digest easier (and when undertaking such a big project that's a very helpful attribute to have!) I felt less overwhelmed, which considering I'll have two eager kids underfoot through the process, was a pleasant surprise. I'm so in love with that workbook! I printed it out and it has a wealth of information – things I never even considered. Tiny House Decisions has been super helpful in portraying how much man power it takes to build a tiny home and I think that has helped my partner realize we will need to hire some professionals perhaps to build a shell and we can do the finishing a inside. Tiny House Decisions has been super helpful in illustrating the pros and cons to every element the house will need, especially if we want to build on wheels or not. Other than that I love how your book outlines every detail from big picture to small details such as custom or pre-made design plans! I have a great design in mind and have decided that I will be purchasing pre-made floor plans when the time comes. Hey Ethan! Your book, interviews, etc. have been SO helpful. Before reading your book, I knew I wanted to build a tiny house, but was stuck wondering how/where to even start. The questions you asked really made me think and confirm that this is what I want to do. It also made me realize that there is nothing simple or easy about building a tiny house on wheels. Thanks so much for proving all the help and guidance!